An integrated model was built to simulate the surface and ground water integrated dynamics in a 130-hectares golf course development. The thirteen lakes proposed in the design are fed by a treated sewage effluent (TSE) line, which is then used for the irrigation of the manicured landscape. 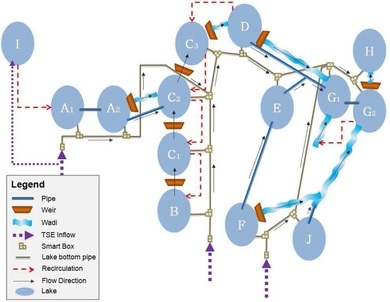 The transport and accumulation of contaminants in lakes and in soils were predicted by using water flows from the MIKE SHE/MIKE11 model and a spreadsheet model developed for this purpose. 1) Is the TSE supply enough to meet the irrigation demand? 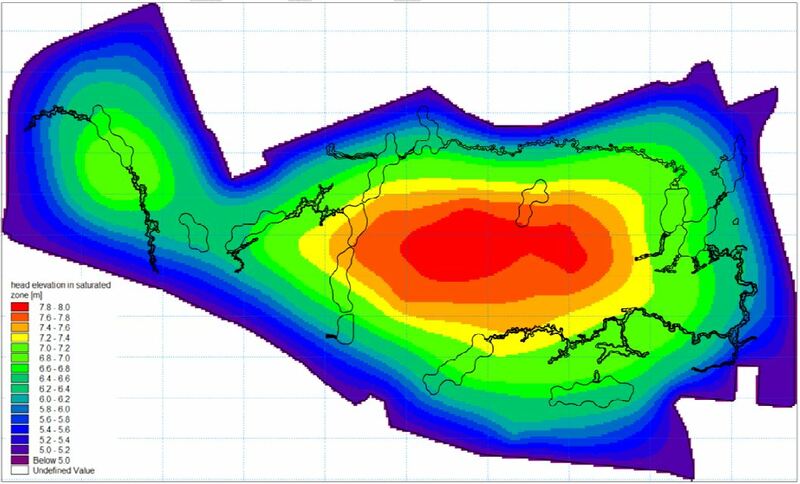 2) Do lake levels remain at around their nominal water elevation during normal operations, TSE shortage conditions, lake maintenance, and design storms scenarios? 3) What is the optimum excess of irrigation, which is defined as the irrigation minus the evapotranspiration rate? ​4) What is the accumulation of contaminants in lakes and soils? 5) What is the long-term buildup of the groundwater table level in the area as a consequence of the excess in irrigation? As a result of this modeling study, important alternatives and mitigation solutions were proposed to the original design.